Published June 18, 2013 By Anna T. This post may contain affiliate links. Regardless, I only recommend sites I've researched and/or used and trust. I personally love getting paid with Paypal because I don't like waiting for checks to arrive, but I know that there are many of you who would prefer not to receive your money electronically and would just like to get a paper check mailed to you. 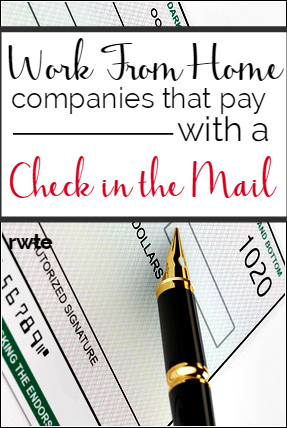 It does seem that the number of work from home companies that still pay by check is starting to dwindle, but there are a handful that still pay that way or at the very least have it as an option. Blooms Today – Phone work. Language Line – Interpretation over the phone. Sedgwick CMS – Filing insurance claims. Intelichek – Phone mystery shopping. Working Solutions – Phone work. Task Rabbit – Running errands and do odd jobs for people. A Closer Look – Mystery shopping – not work from home, but many people who work from home also do this because it's flexible. Appen Butler Hill – Search engine evaluation. Live Ops – Phone work/customer service. NexRep – Phone work/sales and non-sales positions. We Go Look – Get paid to go check things out for people. BrainMass – Share your academic expertise and earn cash. Dollar Stretcher – Writing money-saving articles. Voices.com – Voice over work. Guru – Freelancer site with tons of different jobs you can bid on. oDesk (now Upwork)- Freelancer site where some clients may pay you by check. Yardi-Matrix – Work from home rent surveys/phone work. ETS – Test scoring from home. Zintro – Get paid to give your expert advice. Online Writing Jobs – freelance writing. Perception Strategies – Phone mystery shopping. Turo – Rent out your car for cash. 3 Play Media – Transcription editing from home. Live World – moderation from home. Verilogue – medical transcription and translation. Teleperformance – tech support phone work – cannot confirm they still have a check option, but they used to. Contemporary VA – virtual assisting. Pays every other week with a check. Brainfuse – work at home tutoring. Pays every two weeks with check or direct deposit. Checkout 51 – Get paid back for grocery shopping. Opinion Site – Survey panel. Pinecone Research – Survey panel. Survey Squad – Survey panel. American Consumer Opinion – Survey panel. Global Test Market – Survey panel. eCampus – Sell your textbooks. Groupon Snap – Paid to buy groceries. As mentioned above, I probably missed a few and of course, companies change how they do things on a regular basis. I want my info to be as accurate as possible, so please let me know if you know of any others, or if any of the companies above are actually no longer paying via check. I also want to mention that if you are hesitant to sign up for Paypal, you are really missing out on jobs from many good work from home companies. Signing up is easy, free, and there are all kinds of options available for you to get the money in your hands once it goes there, including mailed check or bank transfer. I've been using Paypal literally for years and love it! Hi Anna, thank you for this list. I would like to share this post on my YouTube channel with your permission of course. I think it will help a lot of people. Sure Alicia, that is fine. Thank you! Very much appreciated! Quality Gal will pay with a check. Thanks, Robert. I will get it added.